It’s starting to get warmer; I’ve discarded the winter cap from under the helmet and the big thick winter gloves are gone too. The winter riding gear I settled on in November – Rapha Merino underlayer, Berghaus t-shirt and softshell jacket combo – is starting to feel a bit too warm, particularly as I’m trying to get my time on the run home to consistently under an hour. A great first week of the month meant I thought I might actually manage the 176 mile a month target I worked out when I first made this plan, but week two poleaxed my optimism with two punctures on two consecutive rides. The first was on a Wednesday ride in, and near the cycle shop in London Bridge. They changed the inner tube, and when I rode home on the Friday, a massive puncture – hissing like an angry snake, audible over the cars – finished the ride just as I’d finished the big hill in Greenwich. It was a long, boring walk to the station, and waiting for 20 minutes in shorts certainly soured my mood. The tyre itself – the stock one which came with the bike – was looking a bit worse for wear, and the shop really should have spotted it. Decided it was time to swap the tyres for puncture-resistant ones. In brief, the downsides are their weight (they’re literally heavy duty), and the fact that they’re just not as quick as regular road tyres. This forum thread rounds up the options; everyone has their own opinion, but the three main choices are Specialized’s Armadillos, Continental’s Gator Skins and the Bontrager Hardcases. Evans carry all three, so I went to check them out in person. The Armadillo is clearly a tougher piece of work than the Gator Skin and since I wanted maximum protection from the roads of London, got myself two Armadillos (£24 each) along with a bunch of new inner tubes. For such tough tyres, they weren’t that difficult to fit. It took around 30 minutes to remove both wheels, pull off the old tyres and tubes and fit the new ones, pump them pup and re-assemble the bike. The bike clearly feels different with the Armadillos. With the original tyres, it was a fast machine, and it always seemed to want to go quicker. There was an appetite to it, and in contrast, there’s real a heaviness to the Armadillos, a sticky dullness. It’s not huge, but it’s noticeable. I can now actually pedal when flying down the hill in Greenwich Park, and going up hill seems slightly tougher. My top speed doesn’t seem to have taken a huge hit though, the grip level is similar and the ride isn’t notably harsher or more uncomfortable. And for the rest of the month, zero punctures, and the tyres are still holding firm at close to 120psi. Given the grotty weather, filthy roads, gleaming pebbles and watery potholes, this is a victory, and gives me a big bump in terms of commute cycling: despite a week off the bike, I’ve managed 11 commutes this month, a grand total of 132 miles. That said, I find January and February, these two awful silver months, hard to deal with. Under dull monochrome skies, motivation has to be scrabbled from the corners, counted up, rationalised, held close. It wasn’t until the last weekend of the month, a sunny Sunday morning, that I actually went out riding for fun. It helped the council has re-opened the Greenwich foot tunnel, so I rode through the park, then under the Thames and round the Milwall docks up to Westferry and Limehouse. On a Sunday, the roads are dead and there’s a wonderful sense of London’s naval history, salty and slightly spooky, in the old warehouses. Then onto one of Mayor Boz’s new cycle Superhighways, zipping down Cable Street before looping over Tower Bridge and taking the usual route home down Jamaica road. An 18 mile circuit, quiet, fast and scenic, it brings the month’s total to 150 miles, 17 short of the target. With 1,773 to go, and ten months, I need to be covering close to 180 miles a month to make it. Still, a few decent spring rides should help. 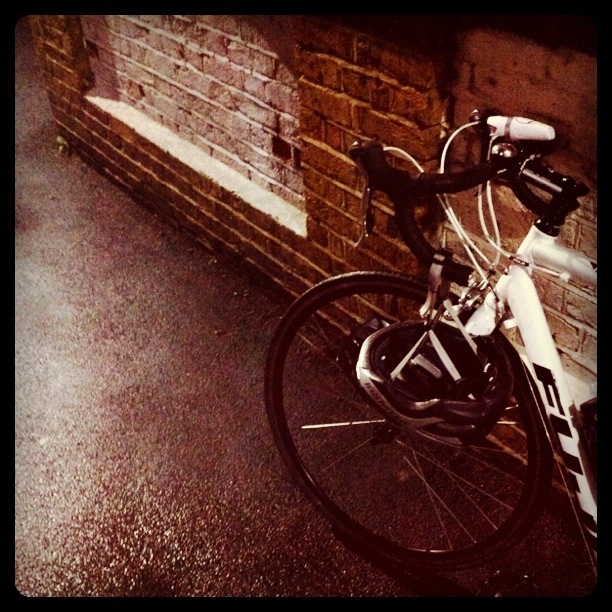 This entry was posted in Cycling, London and tagged BHAG. Bookmark the permalink.